Makin’ Moves, Soulmates, Londonhousemusic and HHA present….. 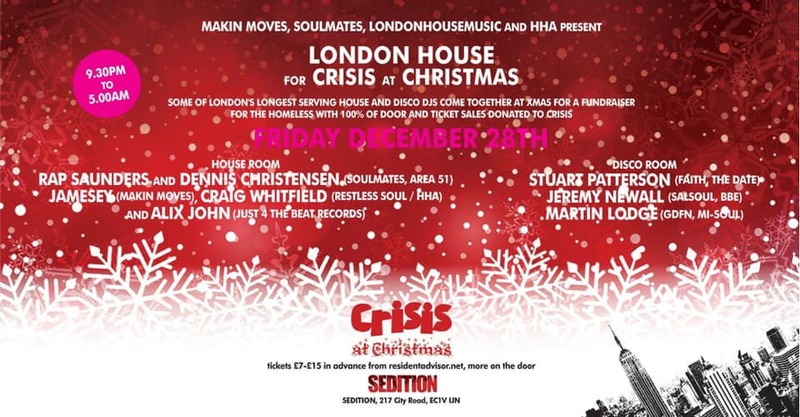 Some of London’s longest serving house (and disco) promoters and djs come together for a special Christmas fundraiser for the homeless. 100% of door and ticket proceeds will be donated to Crisis and help more people to leave homelessness behind for good through Crisis’ year-round housing, employment, education and wellbeing services. Please give generously, you know you will be well entertained with this this line up, deep and soulful house in room one and disco old and new in room two.